In July 2010, Facebook had over 500 million subscribers worldwide and the rapid rise of the site prompted Time magazine to name Facebook's founder Mark Zuckerberg its person of the year for 2010. This novel book advances our understanding of how democratic citizens are transformed by the "Facebook revolution". Despite increasing interest in politics and popular media, there has been little academic work on the impact of Facebook on politics in general, and on democratic processes in particular. The work that does exist has been limited to Facebook's impact on politics as a mobilization tool used by social movement activists. 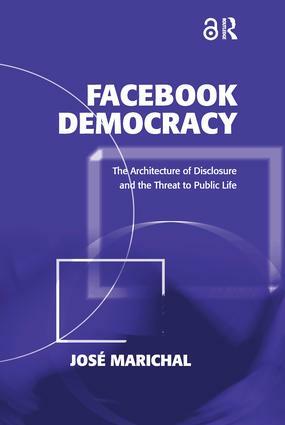 In this book, José Marichal argues that understanding Facebook's impact on political processes requires an understanding of how Facebook's architecture of disclosure shapes the construction of individuals' political identities by drawing users further into their pre-selected social networks. Drawing on a number of disciplines and an ethnographic analysis of 250 Facebook political groups, Marichal explores how Facebook's emphasis on social connection impacts key dimensions of political participation: e.g., mobilization, deliberation, and attitude formation. José Marichal is Associate Professor in the Department of Political Science at California Lutheran University, USA.